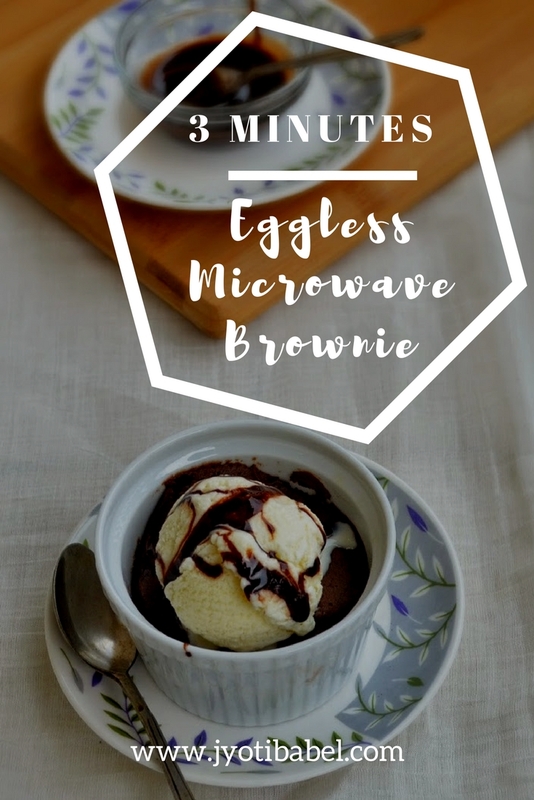 Eggless Microwave Brownie is my go-to dessert when I feel like indulging in a brownie but don't have the heart to bake a whole lot. 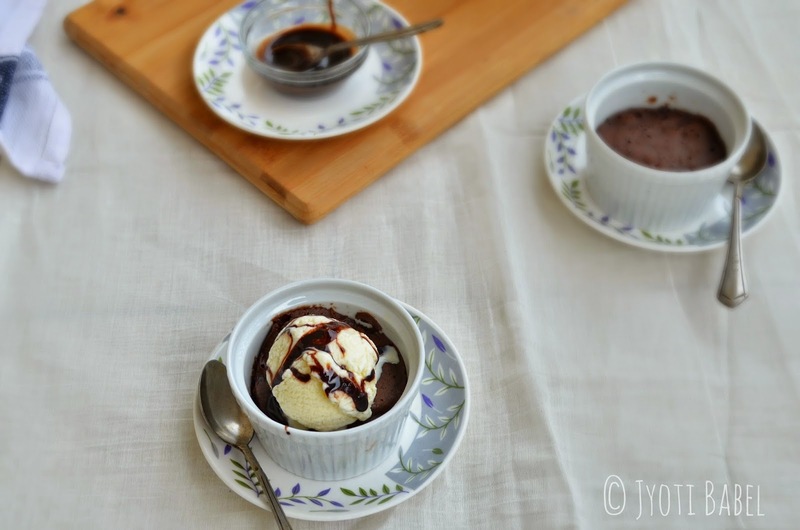 A simple and easy brownie recipe for 2 that can be made in the microwave in just 3 minutes. I am very much a brownie person – I prefer a brownie over a cake any day. There are several reasons for that – brownie is easier and hassle-free to bake. No matter how it turns out, you can always have it with a scoop of vanilla ice cream and chocolate sauce. I have tried several brownie recipes and you can find a few of them here too. But, the recipe I am sharing today here is different from all those I have already shared. 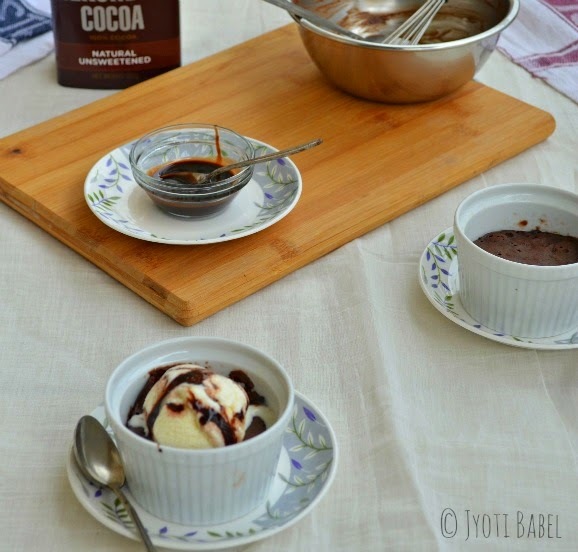 This one is an instant brownie that you can make in your microwave in just about 3 minutes. Yes! You heard that right. With the measures given here, you make 2 serving. It will satiate your brownie craving without giving you the guilt of devouring down a whole batch of brownies! This is a fuss-free recipe that needs only one mixing bowl, a strainer (optional), a whisk and of course 2 ramekins. If you have a friend over, you can make it less than 10 minutes and serve it. Let’s hop to the recipe now. Grease two microwave safe bowls or ramekins. In a medium bowl, add shift all the dry ingredients. Made a hole in the centre and add the wet ingredients and mix to form the batter. Add the chopped chocolate. Stir. Divide the batter equally in the two greased ramekins/bowls. Microwave it on a high for 2 minutes. Take it out and let it stand for a minute. 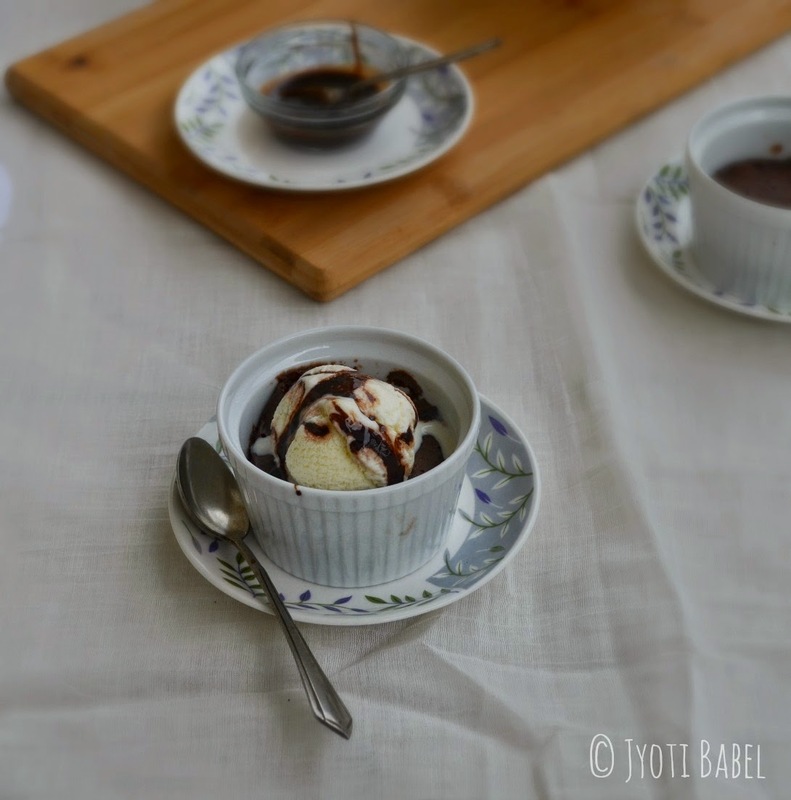 Serve with a scoop of vanilla ice cream and chocolate sauce. Enjoy! Thank you for stopping by! Cheers! wow such yumm one.. n bful clicks.. Thanks Jyoti for this simple & quick recipe! I tried it & Brownie was just yummy! Glad to know you liked it! Thank you Khushboo for trying it out. Glad you liked it. This is such a handy recipe when we have unexpected guests. Just love instant microwave brownie, it ensures controlled indulging and at the same time satisfies our cravings, loved the recipe. This recipe is great when you have midnight craving for something sweet :) such a easy and fuss free recipe. Jyoti you're tempting me with this easy to make brownie recipe. Every time I'll crave for something sweet, I'll think of your recipe. The best part about mug cakes and muffins is portion control. You have one and there are no seconds. So, it satisfies your craving and keeps you in control too. Best for people like me who love their desserts but don't have them as frequently as they want too as they lack control! haha.. Great share Jyoti! 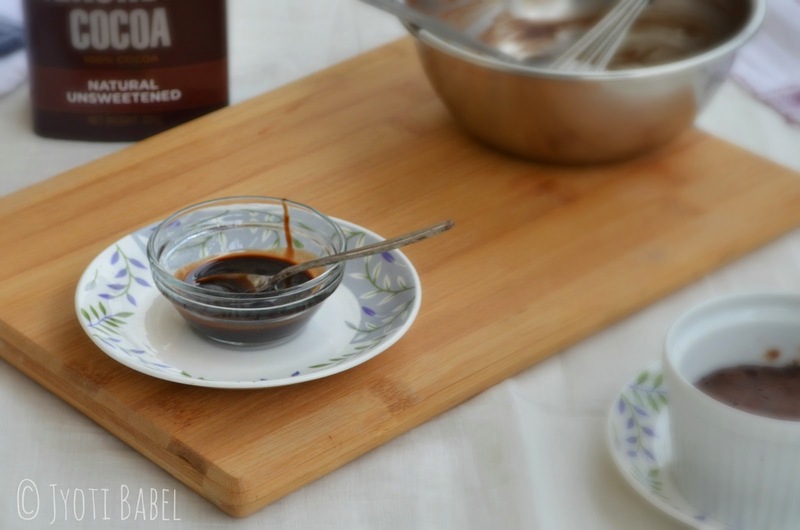 I love this simple and fuss free recipe of eggless brownie..Bookmarking it !! Wow brownie with ice-cream such an lovely bowl of dessert.. pictures are very beautiful..
Brownie topped with ice cream is a combo made in heaven. Looks so tempting Jyoti. Brownie and Ice cream who can say no to this.. Awesome and beautiful clicks. Who would not love such a cook and easy dessert? Good to make when you have the sweet carvings. With my sweet tooth portion control is difficult but will love to try making this brownie . Eggless microwave brownies are perfect to satisfy our sudden brownie cravings. Fantastic share Jyoti.